An elementary school near Quesnel, B.C., is waving good-bye to its wireless internet connections due to the uncertainty about the safety of the technology. North Cariboo Christian School, a private elementary about 10 kilometres south of Quesnel, is shutting down its Wi-Fi link. An Ontario teachers’ union is calling for an end to new Wi-Fi setups in the province’s 1,400-plus Catholic schools. The Ontario English Catholic Teacher’s Association says computers in all new schools should be hardwired instead of setting up wireless networks. It also says Wi-Fi should not be installed in any more classrooms. In a position paper released on Monday, the union — which represents 45,000 teachers — cites research by the World Health Organization. This picture taken from the Elie House Road shows the Dialog antennae base from the rear side of the residence on which it is located. The tiled roof seen below is the roof of a ground level single storied house. This picture taken from a position close to the entrance of the lane shows the height of the residence on top of the third floor of which the antennae base is being constructed and the direction of one panel so far installed on this side. See, the close proximity of the houses around the premises with the antennae base. This picture taken from the second floor of the premises right opposite the location of construction of the Dialog antennae base separated by a mere 20 feet gravel road and just one storey higher. 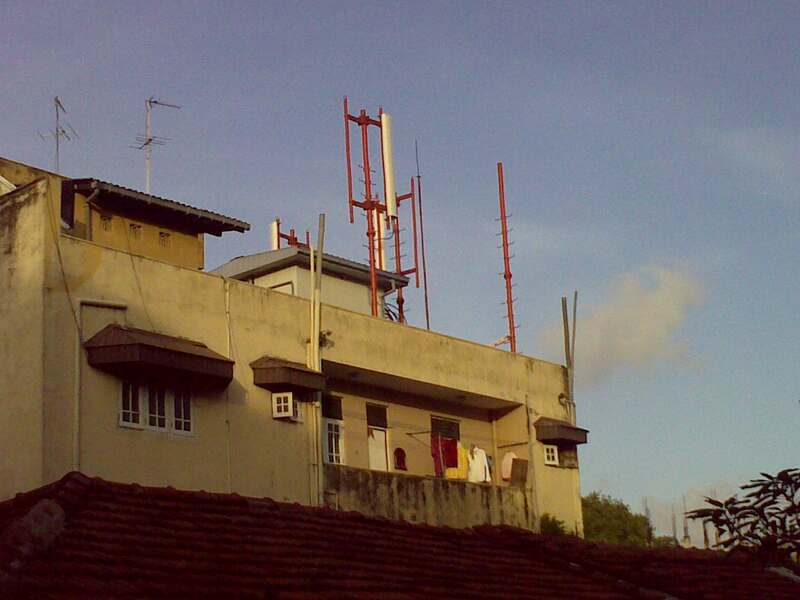 This picture shows the right side of the residence where the Dialog antennae base is being constructed with another panel of the antenna added to the one on the left side. 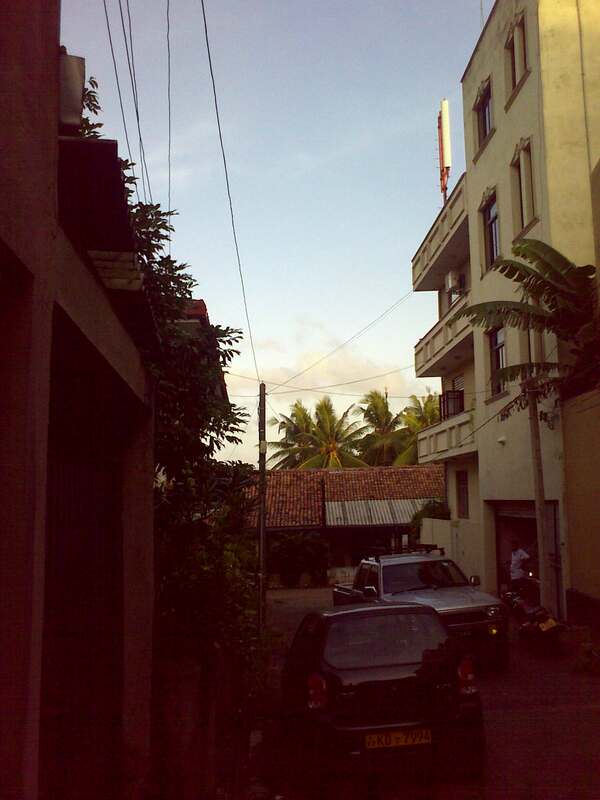 On the left side of the picture where a parked car is seen is a residence and to the left from where the picture is taken is also a residence. Not only down this lane but also all around the location where the Dialog antennae base is constructed are residences. Here is a specimen of such a request which you may want to develop after reading our appeals. We are aware that Dialog has been constructing a cell phone tower antenna in the midst of a dense neighbourhood at premises 94/3, Elie House Road, Mutuwal, Modera on a three storied house. A two storied house directly opposite the Dialog installation is separated by a mere 20 feet gravel road. The neighbours fear that constant exposure to radiation from the Dialog antennae would cause them various illnesses and potentially cancer in the long run. We are concerned about the well being of these people who are expressing their concern over this installation. Please, kindly take necessary action to remove this installation from the above premises. If you know any of these gentlemen/ ladies, pl. make the same request from them. We refer to the news item appearing on page 5 of The Island newspaper on 24th June 2010 under the heading “No link between cell towers, kids’ cancer risk.’ To begin with, the headline is misleading as shown by the title of the article it refers to: “Mobile phone base stations and early childhood cancers.” Moreover the conclusion of the said study is that it “found no association between risk of childhood cancers and mobile phone base station exposures during pregnancy” (italics, ours). Therefore, on the basis of the findings of this study one cannot arrive at the conclusion suggested by the headline, generalizing it for children living near cell phone towers being exposed to the radiation over long periods of time. In interpreting the data of the said study ( pl. see here for the full text of the article at http://www.bmj.com ) the proximity of the children studied to the location of the cell phone towers and the height of the towers are crucial. Our concern here is misinterpretation of study findings such as the present one as indicated by the relevant headline may be used by unscrupulous corporate sector companies to indiscriminately encroach upon dense residential areas erecting cell phone towers without any ethical corporate social responsibility towards residents of such areas. 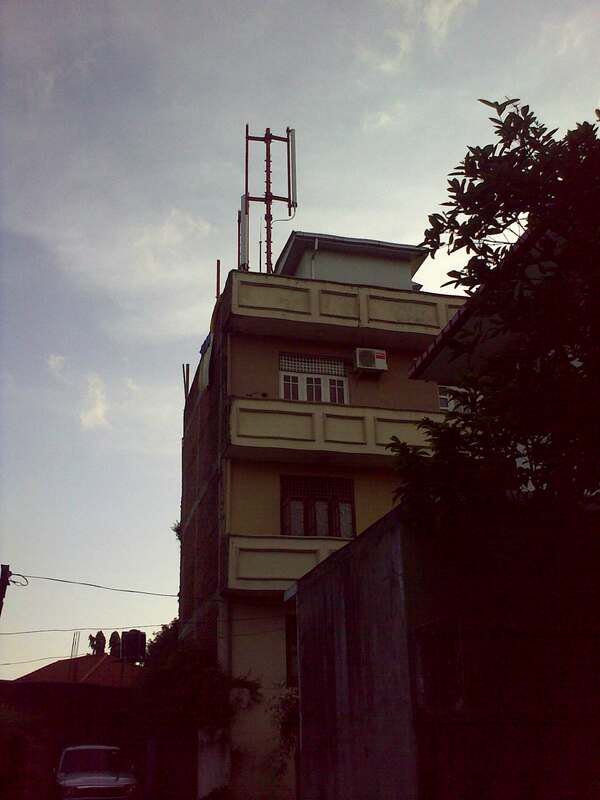 We the residents of Elie House Road, Mutuwal, Colombo 15, have been protesting against such an erection of a cell phone tower by Dialog at the premises 94/3, a three storied house on Elie House Road, right in the middle of a densely populated neighbourhood without consulting the residents of the neighbourhood at all. One house affected by this installation is a two storied house directly opposite the installation separated by a mere 20 feet road. It is our belief based on the examination of the vast literature available on the subject on the internet that the health risks involved in the long drawn exposure to radiation from cell phone towers during 24 hours of the day, on children, the sick and the elderly and even healthy adults due to the close proximity and the lower elevation of cell phone towers as found in our case cannot be simply overlooked due to the results of studies such as the one referred to in the above news item. We need to consider the fact the effects of long term whole body exposure to transmissions from cell phone antenna towers is not simply not known yet with certainty to simply conclude that it has no negative impact on the health of the people thus exposed. We need to take into account not only the personal experience of various sickness by people who are thus exposed over long periods of time and relatedly leave room open to examine the body of such evidence at hand that suggests that bio effects and health impacts can do occur at exquisitely low exposure levels of radiation from these towers, levels that can be much below standard public safety limits. The prevailing public safety limits area based on the thermal effects of radiation whereas the non-thermal effects of radiation are yet to be studied in any significant manner. 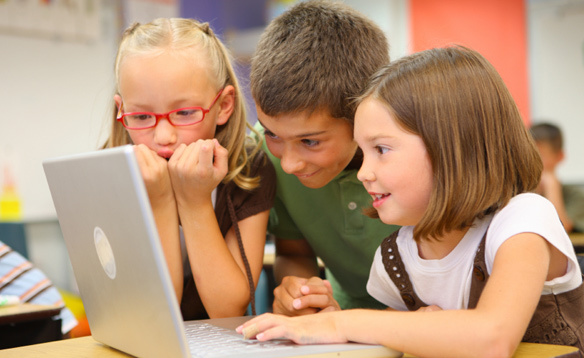 What is suggested by the literature available is that Electromagnetic Frequencies related to “cellular” relay antennas will affect the children most as they will be exposed to these over a longer period. Therefore the public should not buy into the Corporate view that that “one more antenna in a residential neighbourhood won’t do much harm”? 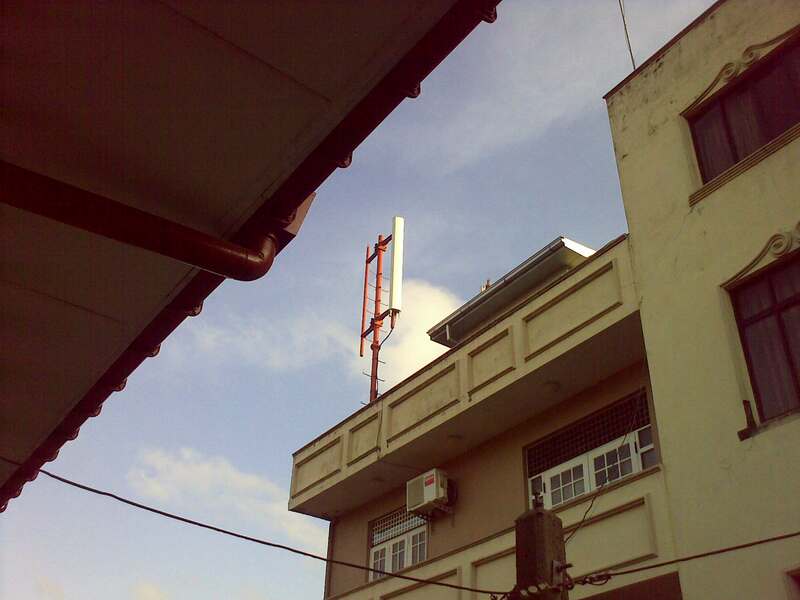 Hence, we the neighbours at the Elie House Road urge Dialog to decommission and dismantle the cell phone antenna tower it has erected right on our face on the premises 94/3, Elie House Road, Mutuwal. Is this the response with ‘corporate responsibility,’ to our appeal to Dr. Hans Wijesuriya, CEO, Dialog? On the 25th December 2008, we submitted an appeal in writing to Dr. Hans Wijesuriya, CEO, of then Dialog Telekomon our concern that Dialog Telekom had started constructing a mobile phone transmission antenna at 94/3 Elie House Road, Mutuwal, Modera, Colombo 15 in the midst of our houses in this dense residential area. We expressed our concerns with regard to the possible impact of this intrusion on our lives and those of our loved ones – our children, the elderly and the sick, our neighbours and the environment, which we believe cannot be simply allayed by the standard statement that there is no conclusive evidence to prove that the antenna would cause any significant hazard to our health or environment. We requested Dr. Wijesuriya to exercise his good sense as a citizen willing to act responsibly, towards the concerns of the community and, adhere to corporate social responsibility, by stopping the construction in the midst of our neighbourhood. For one and half years to this date, none of us who signed the petition got a response from either Dr. Wijesuriya or his representatives and what we gathered was that the above site constructed by Dialog right in the middle of our neighborhood was not commissioned. Therefore we let the matter lie. However, it seems that after about one and half years of silence on our appeal to Dr. Wijesuriya, Dialog company has decided to respond to us. The Dialog company, yesterday, that is on 21st of June 2010, commissioned the cell phone tower in our neighborhood thus starting the transmission of potentially cancer causing radiation in our neighborhood. This is the same company that claims to protect children in cyberspace and gifted the ‘Nenasa‘ programme, state-of-the-art Digital Satellite Television based Distance Education Bridge, to the Ministry of Education and Sri Lanka’s student population. But Dialog has not been not willing to listen to our appeal to not to erect a cell phone tower that radiates potentiality cancer causing emissions affecting the children in our neighborhood, not to talk about the elders and sick who are the most immediately vulnerable to such radiation. Dialog, is this your corporate responsibility?